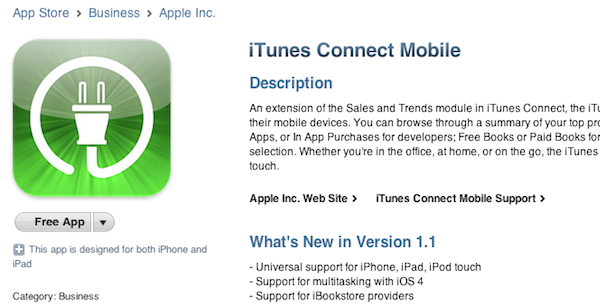 Apple has just updated their iTunes Connect Mobile app to Version 1.1, bringing with it support for iOS 4 multitasking, retina display on 4th gen iPod touch and iPhone 4, iBook Store stats, and support for iPad users. The app is now a universal binary, meaning the one app now works on all iOS devices. The iTunes Connect Mobile (iTC Mobile) app for iPhone allows you to review your sales and related trends, and make informed business decisions while you’re on the go. You can also view your aggregated unit sales information by product line (e.g., paid apps, free apps, In-App purchases), market (e.g., U.S., France) and individual product. Your information is displayed graphically and can be customized to view select periods of time. Developers can download the iTunes Connect Mobile app for free from the App Store, here. Next Entry: MobileMe features coming to iOS devices free of charge?